The Inter-Service WIndsurfing Championships were held at the Weymouth and Portland Sailing Academy on 8-9 September, with the RN Windurfers looking to retain their 2015 Inter-Services Title. A team of 8 RNSA Windusrfers competed in the Inter-Service and RN Championships at Portland in excellent conditions with winds between 18-24 kts. 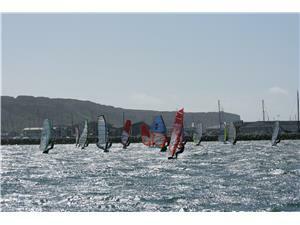 The conditions allowed the racing format to be cross-wind slalom with 3 laps of a 5-mile race. The racing was very close with a strong fleet of 20 Navy, Army and RAF sailors, many of whom compete on the National circuit. Seven fast and furious races were completed on the first day and an additional 3 in slightly less favouable conditions on the second day. The RAF sailors were very good and competetive but they lacked a full team and were uncompetetive overall, but the Army fielded a strong competetive team with a depth of sailors making the result very close. However the consistency of Tom Eskdale, Paul Morris, Aidran Wallis, Dave Strudwick, GAvin Nicholson and Jason 'Tom' Sawyer meant the Navy won through and retained the title of Inter-Service Champions. The RNSA Windsurfing committee would like to thank Wayne Shirley and Jon Glass for their support as race officers for the Race and Novice Fleets.